Our guide to the bars in Prague with live music. On any given night there is pub or bar somewhere in the city with a solo artist, duo or live band providing free entertainment. If you are looking for live jazz and blues concerts, check out the Prague Jazz Clubs. 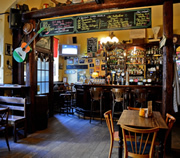 Well situated between the Old Town Square and Wenceslas Square, McCarthy's has the aged Irish pub feel off to a tee. 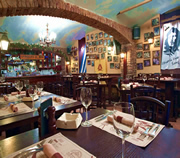 It offers an alluring mix of satisfying drinks, lively atmosphere and big screen coverage of top sports. But for good measure it also houses a disco in the basement. Attracts everyone from couples and expats to hen parties and stag dos. 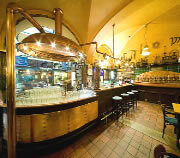 The Dubliner Irish Bar in Prague has everything a good Irish pub should: lively music, great atmosphere and fine beers. 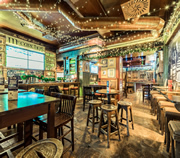 This warm, welcoming pub is also a sports bar, with 2 large screens and 14 LCD TV's showing Premiership and International football, plus American NFL football. Ideal for the big match or for Prague stag nights and hen parties on a pub crawl around the city. A little piece of Ireland in a quiet corner of Prague, just five minutes walk from the Old Town Square. James Joyce is a traditional Irish pub with a casual atmosphere, offering a warm and hearty welcome, and some of the freshest Guinness in Prague. 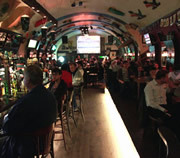 There is TV coverage of major sports occasions, in a calmer setting than other sports bars in Prague. U Fleku is a large pub, restaurant and microbrewery rolled into one. 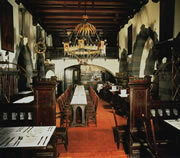 This huge, sprawling tavern is a complex of rooms laid out in true European beer hall style. Waiters are a bit grumpy, but none-the-less U Fleku offers a good experience of traditional Czech food, beer and entertainment. Groups can tour the microbrewery. Live accordion all day. 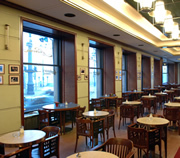 Café Slavia is a traditional grand Art Deco style café by the river in Prague, next to the National Theatre. It has huge plate glass windows running along two sides, through which visitors can watch trams rattling by and gaze across the river to Prague Castle. The hot chocolate is made from melted chocolate. The cakes are delicate, smooth and beautifully presented. Live piano every day from 5pm.